Milo Ventimiglia and Mandy Moore. 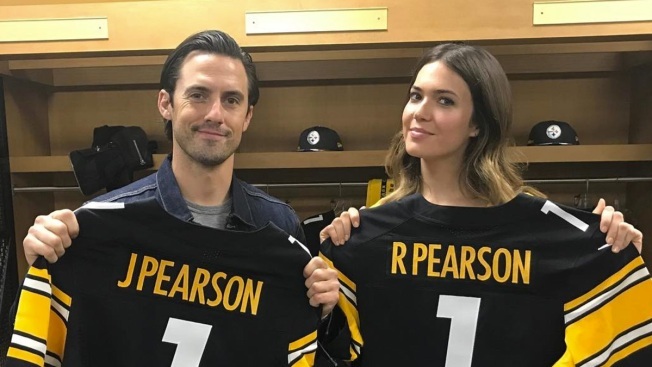 “This Is Us” stars Mandy Moore and Milo Ventimiglia announced the Pittsburgh Steelers' fourth-round pick in the 2017 NFL Draft Saturday, "Today" reported. The pair, who play Steelers fans Rebecca and Jack Pearson, traveled to Pittsburgh’s Heinz Field, where they were met with a cheering crowd full of fellow fans, waving their “Terrible Towels” in anticipation for the big announcement. Moore encouraged the crowd to watch the upcoming second season of “This Is Us,” which premieres this fall on NBC, and Ventimiglia took the mic to get the team’s fans pumped up. "Steelers Nation, you guys ready to get those towels up?" the actor yelled before announcing that the Steelers had selected Tennessee quarterback Joshua Dobbs as the No. 135 pick.